Few studies have quantified changes in riparian and adjacent forest across landscape units. 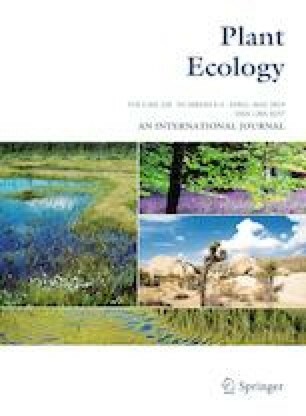 In this study, the composition and structure of riparian and adjacent forest were compared in a humid and a semiarid ecoregion in northwestern Argentina: the Yungas forest and the Western Chaco. We expected that differences between riparian and adjacent zones could be less marked in humid than in semiarid regions. Ten sites were surveyed with a block design. An Importance Value Index, Rank-Abundance curves, and Analysis of Similarity and multivariate analyzes (NMDS) were performed to evaluate differences between forests. Stream and floodplain widths, lateral, and longitudinal slopes of streamside were analyzed by a principal components analysis (PCA). NMDS and PCA axes were correlated to analyze the relations among physical and biological arrangements. Results revealed that riparian forest may be very different from the adjacent in both ecoregions. Marked differences in geomorphological and physical features of streamsides were found between ecoregions and they were strongly associated with assemblage distribution. In Yungas forest, dominant species were different at all sites, according to the altitudinal stratification of this region. Within Western Chaco the species Salix humboldtiana Willd. and Tessaria integrifolia Ruiz and Pav., were commonly dominant in riparian sectors. The dominance of these species in both sectors by the widest rivers could indicate that the dimensions of the riparian zone in those sites are greater than those by the smaller streams. Our study reinforced the concept of riparian zones as dynamic ecosystems and we propose considering a landscape perspective in managerial decision making. Communicated by Shayne Martin Jacobs. The online version of this article ( https://doi.org/10.1007/s11258-019-00929-w) contains supplementary material, which is available to authorized users. We are grateful to Sofia Malcum, Mario Feylling, Nicolas Laguna, Sebastian Albanesi, Guillermo Hankel, Dante Loto, and Carlos Navarro for their assistance in sampling trips; to Luciana Cristobal for helping to edit the image of the study area; to Sergio Georgieff, Ignacio Gasparri, Carlos Cultid, Daniel Dos Santos, and Juan Pablo Juliá for their valuable comments; to Hugo Fernández and Eduardo Domínguez for a review of the manuscript; as well as to the three anonymous reviewers for their comments and suggestions which improved the manuscript. This study was supported by fellowships of ANPCyT (National Agency of Scientific and Technological Promotion) and CONICET (National Council of Scientific Research, Argentina) and the following grants: ANPCyT PICT 1067–2012, PIP-CONICET 0330, P-UE CONICET 0099, and Universidad Nacional de Tucumán POA2-2016/05. Allophylus edulis (A. St.-Hil., A. Juss. and Cambess.) Hieron. ex Niederl. Cestrum strigilatum Ruiz and Pav. Chrysophyllum marginatum (Hook. and Arn.) Radlk. Iresine diffusa Humb. and Bonpl. ex Willd. Rubus imperialis Cham. and Schltdl. Schinus fasciculatus (Griseb.) I.M. Johnst. Tessaria integrifolia Ruiz and Pav. Urera caracasana (Jacq.) Gaudich. ex Griseb. Vernonia fulta Griseb. = Quechualia fulta (Griseb.) H. Rob.